"If you can survive this, nothing can kill you." The Match Factory has debuted an official promo trailer for the German indie drama O Beautiful Night, which is premiering at the Berlin Film Festival this month. The film marks the feature debut of Xaver Böhm, and it's a highly saturated, neon-lit, poetic journey into the existential realm. The plot is about a guy named Juri who encounters Death one night, who takes him on an Alice in Wonderland-esque trip upon which he falls in love with a woman named Nina. Noah Saavedra stars as Juri, Vanessa Loibl as Nina, and Marko Mandic as Death. I've already been hearing good things about this film at the festival, and this trailer definitely shows some promise. It seems a bit over-stylized at first, but I dig the existential dread and the trippy footage they share in this tease. Keep an eye on this one. Although Juri (Noah Saavedra) is young, he lives in constant fear of dying. One night he meets a dark figure who claims to be Death incarnate and so begins a bizarre trip through the night, during which Juri meets and falls in love with Nina. But come dawn, one of them must die. 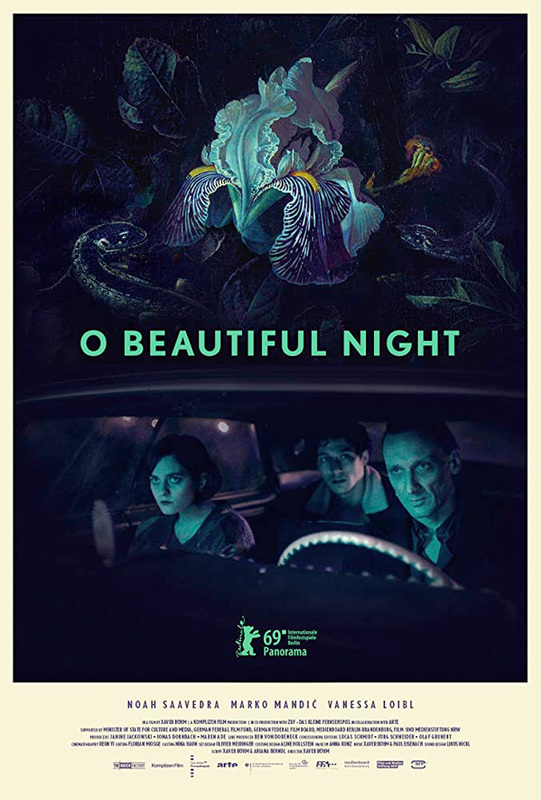 O Beautiful Night is directed by German filmmaker Xaver Böhm, who also goes by Xaver Xylophon, a freelance animator and filmmaker making his feature directorial debut with this film. The screenplay is written by Ariana Berndl and Xaver Böhm. This is premiering at the Berlin Film Festival this month. No other release dates are set, as the film is still seeking distribution internationally. Stay tuned for more updates. First impression? Who's interested?